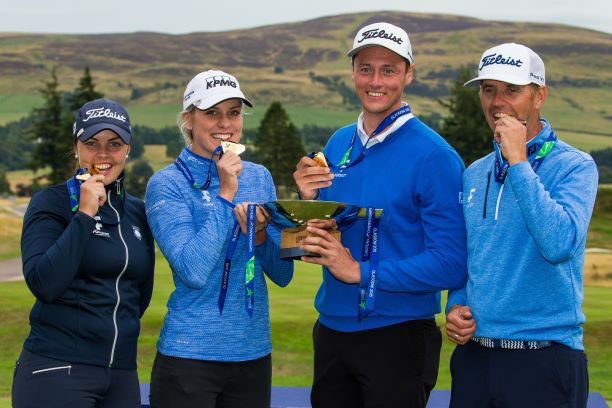 Iceland’s quartet of Vladis Thora Jonsdottir and Birgir Hafthorsson paired with Olafia Kristinsdottir and Axel Boasson created golfing history when they won the European Championships inaugural mixed team event at Gleneagles Resort in Scotland. The unfancied Icelanders took the gold medal on Saturday [Aug 11] with an aggregate score of 141 over the 36 holes played by the two pairs. It was their country’s first medal of the European Championships. They took the main prize ahead of the British number three team Meghan Maclaren and Liam Johnston, and Michele Thomson and Connor Syme, who won the silver medal. The bronze medal went to Sweden’s second team quartet of Johanna Gustavsson and Oscar Floren, and Julia Engstrom and Daniel Jennervret after a sudden-death play-off against Spain’s Noemi Jimenez and Scott Fernandez, and Silvia Banon and Pedro Oriol.